Though Apple co-founder Steve Jobs unveiled the iPhone at the MacWorld Expo on January 9, 2007, it would not be until Friday, June 29, 2007, that it officially went on sale. You had one choice in cellular carriers, AT&T, and though it did not support the then-new 3G network or have any apps, it was described as "revolutionary" and "game-changing" by the press. 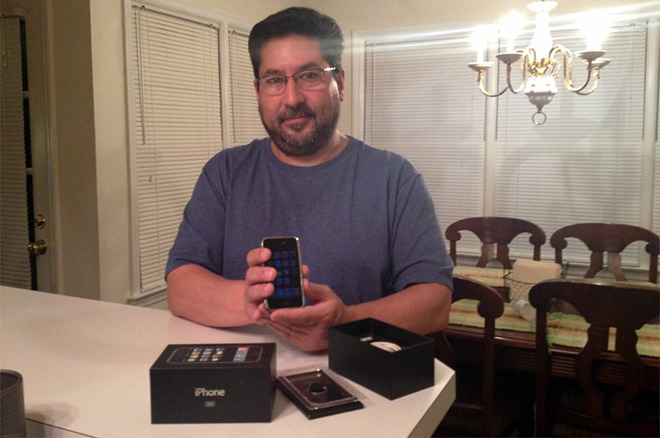 David Greelish holding Apple's first-generation iPhone. Editor's note: David Greelish has studied computer history and collected old computers for over 20 years now. He is a computer historian, writer, podcaster and speaker. He has written extensively about computer history, created and participated in numerous podcasts, plus conducted both audio and written interviews with notable people in the industry, like Ed Roberts, John Sculley and Alan Kay. He was the founder of the original Historical Computer Society, publisher of the fanzine Historically Brewed and is currently the founder of the Atlanta Historical Computing Society. He has published all of his computer history fanzines along with his own story in the book, Classic Computing. Greelish is writing special to AppleInsider. In fact, the new phone created so much hype and such a buzz, in an almost religious fervor, some even dubbed it the "Jesus phone." It would be just a little over a year later that the iPhone App Store opened on July 10, 2008, and then the iPhone 3G shipped the next day, securing the iPhone's design and technology dominance for years to come. 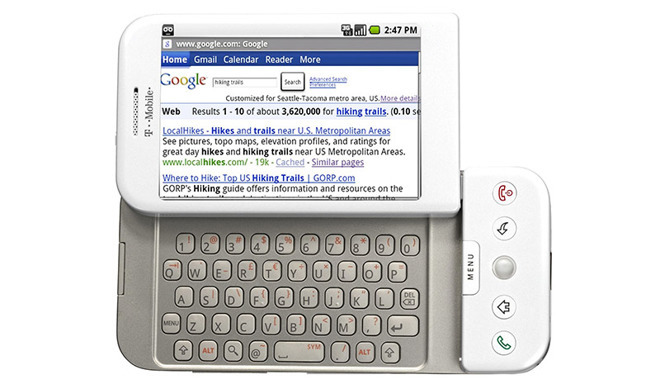 The first Google Android phone, the T-Mobile G1, was released later in September 2008, but received mixed reviews. Both its hardware and operating system had been heavily influenced by the announcement of the iPhone in the previous year. The iPhone introduced the first practically implemented multi-touch screen and virtual keyboard, allowing most of the entire phone's face to be available for display. Today, it's a toss-up decided by taste and opinion as to which is better, Android phones or iPhones, but regardless of which you prefer, you are using the legacy of the iPhone. In software capabilities, Apple's iPhone was arguably the first fully realized smartphone, as well as the first device to fulfill the requirements in establishing a true "third tier of personal computing." There had been many so-called "smartphones" in the marketplace since the late 1990s, but most people would now agree that a smartphone is not just a cell phone with a PIM (Personal Information Manager), containing To-Do lists, Contacts and Calendar. A true smartphone had to deliver internet connectivity by way of email and web browsing. There had been a few good smartphones in the past that adequately accomplished one or two of these requirements. BlackBerry dominated the business realm for many years and it was highly praised for its good email interface and side-wheel scrolling capabilities. The Palm Treo and T-Mobile Sidekick were also both standouts as smartphones in the early to mid-2000s. However, all three had OK-to-mediocre browsing capabilities. It wasn't until the iPhone that there was both a desktop-class email client and web browser available on a handheld device. Many now forget that during his introduction of the iPhone, Jobs touted the fact that the "iPhone OS" was built on good old tried and true OS X. Apple was the first company to successfully scale down a fully implemented personal computer (with a phone) into a handheld device. Other than its obvious limitations in screen size and interface, it was a handheld personal computing communications device. The iPhone was the first serious contender in a mode of computing that had been struggling to mature for over twenty years. It created a paradigm shift in the smartphone market and when the iPad was released in 2010, it did the same to what was/is commonly known as a "tablet" computer. These devices and their Android counterparts finally established a mature third tier of personal computing. The first tier had been established by the first desktop personal computers and then the second tier by portable computers. Portables started out as clumsy, bulky "luggables" and slowly evolved into laptops. It wasn't until the 1990s that a laptop could take the place of a desktop, and only in late 2008 did laptops begin to outsell desktop computers. The handheld category did not have a steady growth curve in establishing the third tier. In fact, it is interesting to note that it evolved slowly from mostly mini laptop designs of the late 1980s, into the PDA (Personal Digital Assistant) stylus tablets of the early to mid-1990s. Then, by around 1996, the industry and marketplace mostly abandoned the whole concept. "Pen computing" as a new interface to computers was seen as a failed technology. For years after, the pen as a stylus was mostly used in the lowlier organizer category by Sharp and a few others. It wasn't until late 1997 when the PalmPilot became popular, and its sales began to grow, that a renewed interest and confidence in this input method slowly grew. 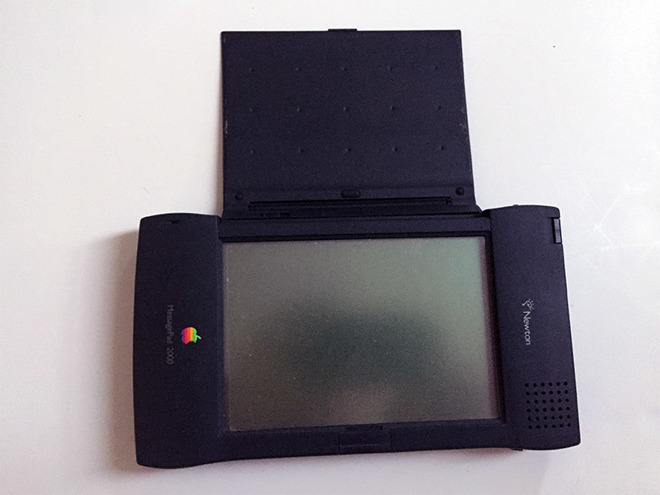 However, an organizer was a far cry from a full-featured pocket computer. Perhaps pen computing still exists. As Jobs pointed out in his introduction of the iPhone, we all have built-in styluses on each hand. Using your finger as the stylus was the other ground-breaking innovation in conjunction with the multi-touch interface. Everyone who saw the iPhone knew that eventually all smartphones would one day work that way. Handheld computing devices, whether smartphones or tablets are now practical alternatives to desktops and laptops. Many of us did not purchase an iPhone or Android phone during the early years, but most everyone has one or the other now. Certainly, no other device has influenced the culture so dramatically, and so quickly.